Kathy Sdao one of the leaders in the field, and a class act all around. Don’t miss a chance to soak up her knowledge, energy and good energy! I am thrilled to have managed to take all but one of Kathy Sdao’s sessions. She is an articulate, personable, and dynamic speaker, passionate about the subject matter. Her lectures solidly filled in most all of the gaps in my foundation in three short days. Kathy Sdao’s presentation to our guide dog instructor staff was informative and very motivational. Her dynamic teaching style was balanced with a wonderful open mindedness in learning about our guide dog program’s mission. Kathy’s energy is contagious and highly motivating to listeners. Kathy was not only receptive but also delighted to walk under blindfold to experience what it’s like to travel with a guide dog. Her openness to learn about and acknowledge the challenges of our guide dog work added significance to her presentations to our staff. Guide Dogs for the Blind looks forward to having Kathy Sdao as a recurring continuing education presenter and welcomes her future visits to our campuses. Michele Pouliot; Director of Research & Development; Guide Dogs for the Blind, Inc. It was such pleasure to work with you and definitely look forward to more visits! We came away VERY impressed by your intuition, lucid breakdowns and great love (& knowledge) of animals. It’s good to know that there are people out there like you who can help us better understand our pets. I bought your GREAT DVD set “Improve your I-CUE” and I’m currently viewing it and taking lots of notes along the way…your DVD’s are like a huge gift for me. As a former teacher of 19 years I love your enthusiastic and very thoughtful teaching style. Your analogies, real life examples, and humorous ways of getting us to relate to the ways dogs learn are fantastic. I am definitely hoping to attend one of your seminars. I’m in the UK and I became aware of your dog training methods after watching your DVD Get SMART for Dog Sports. I compete here in Obedience and your DVD has been so beneficial in the way I train my dogs. I have always used a clicker in my training, but I can honestly say that I don’t think I had understood the science of clicker training until now! It seems I had been ‘using’ a clicker, but not really understanding what I was doing? Your DVD is the best I have come across and both my dogs and I have achieved much more in training since watching it than I thought possible! Thank you so much, I just wish I could attend your training courses! The book [Plenty in Life is Free] is extraordinary and lovely, but the DVD [Plenty in Life is Free]… oh, the DVD is a leap into pure grace and passion because of who Kathy Sdao is being… I have both… if I ever need affirmation as a trainer, the DVD does it for me. Your articles are excellent. You are a beautiful writer and you are very popular in Australia. Thank you for the follow-up on our session with Kathy yesterday. It was very good, although difficult to hear what we feared might be true. Kathy was compassionate, straight-forward and very informative and knowledgeable. We feel glad to have finally found her. Two years ago I and my husband consulted with you regarding Parker, a Border Collie with generalizing anxiety precipitated by exposure to fireworks. His quality of life was degrading, he was losing the ability to recover from fear episodes and had even stopped being able to participate in agility….I just want to let you know that Parker is a happy dog once again, thanks to our persistence and the diligent following of your recommendations….Most importantly to me, he has regained his resilience and his year-round quality of life is great. He has come a long way from being the haunted soul of 2 years ago and I just wanted to say thank you and to let you know that he is a success story. You do great work. Incredibly knowledgeable speaker with terrific, well researched and substantiated information. Dynamic speaker, good sense of humour and very engaging.…Would go to another seminar/workshop of hers any time. Kathy is a high energy, humorous and engaging speaker. She made the information relevant and interesting. Her delivery style and the content of the seminar was so fantastic, that I was always surprised to see how the time flew by so quickly on both days. I would not hesitate to come back and see Kathy speak about any topic. She is a gem and we were blessed to have her. Bring her back again! I wanted to thank you for talking with me at length last week. Your comments and insight were very helpful….I appreciate all your help and will highly recommend your services. Just wanted to thank you for a terrific seminar in Des Moines! We learned a lot, and your enthusiasm is infectious. What an awesome clinic! I know I’ve said it before but I just love your energy and the way your spirit shines through. It adds so much to the presentation of your science. What a wonderful gift to possess. Thank you for choosing to share it with others! Kirby is doing great!…So far, no more reports of a barking Kirby…that means a happy mom and hopefully a happier hound! Thank you so much! Not only does it give me some peace of mind but most importantly, Kirby is doing better and will be happy and healthy because of these changes! You certainly gave me plenty to think about – what a phenomenal opportunity to sit down and hear hard facts and honest strategies. I am so grateful for you! I’m just letting you know that Kohl is doing great! Everything that you suggested is working and he is very happy to be given the job of a “Warm Fuzzy Dog.” I’ve been very consistent in giving him treats and making it a “GOOD THING” when people come to the door. He now greets people at the door with a wagging tail. Thank you so much for your training of me. You’ve really enhanced three lives, Kohl, my son and myself. Thank you! Thank you for your presentation in Spokane this weekend!….I wanted to ensure you know that content, delivery and sequence of delivery was wonderful, helpful and inspirational….You provided me with many of the “missing” jigsaw puzzle pieces and non-judgmentally offered opportunities for me to re-evaluate some of my processes….Cues – Chaining – Shaping information was extremely helpful. Absolutely LOVED the seminar in Spokane, WA this last weekend. It was by far the best seminar I have attended in 30 years, so I guess it makes it the best one ever! I just attended the 25-26 July seminar you had in Spokane. I learned so much….I loved the exercises, workshops, and dynamic lectures. The whole thing was awesome! I just wanted to share with you my appreciation for your DVD production (“Get SMART about Training”). Watching you gives me energy….You are the consummate professional and a class act. What a wonderful role model you are for other training professionals. Kathy Sdao is a commanding speaker with an excellent grasp of her subject and the ability to pass that on to others! This is a belated thank you for the “dog-dog reactive” training seminar you did in Poulsbo. I loved it almost as much as 40 million puppy kisses! Your knowledge and humor and ability to assimilate technical information and present is awesome. 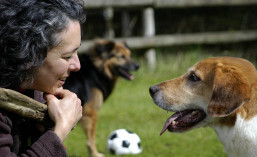 If you are in need of a trainer or behaviorist or are looking for the perfect seminar, the one to see is Kathy Sdao. Kathy masterfully weaves her incredible talent and knowledge with passion and dedication to whomever she is working with. Whether one-on-one or in a seminar, you can be assured you are getting the best of the best. Kathy is utterly brilliant and amazing. In my mind, Kathy is in the top 1% of trainers and educators in the world. If you get a chance to see Kathy present a seminar or have a chance to work with Kathy, RUN don’t walk. Thank you so much for your sharing your time and training with us. We were blown away by your insight and your ability to look beyond the physical manifestation of the problem. With our new plan, I think we will become better trainers and I have confidence that Molly will find her spirit and regain her love of the sport. Kathy is very professional, personable and prepared. Class was packed with information. Very energetic instructor and excited about her subject which makes the student (me) excited. Very knowledgeable teacher. Thank you! Your fabulous presentations basically saved the day, everyone was ‘ooohing’ and ‘ahhing’. I had the best time…You have left much joy in your wake. Heather has been beaming with renewed energy & enthusiasm since seeing you, and has been breaking into some weird dance because she’s signed up for your spring thing too. Very odd to see a shelter worker acting in such a way! I am highly impressed with the wealth of knowledge trainer Kathy Sdao continually shares with us. I am excited about the positive reinforcement method of dog training she teaches and I LOVE the results I have had in such a short time using these methods with my boxer. As a former police K9 handler, my husband was skeptical of the clicker training method. However, after witnessing such quick results with our own dog he now sees the advantage of clicker training also. And personally, as the owner of a very energetic and increasingly strong boxer, I am very excited to have a way of training my dog that is not only positive and loving, but one that doesn’t require huge amounts of physical strength on my part just to get through a training session or go on a walk. I could go on and on about how happy and excited I am to be attending Kathy’s training classes with my dog and how impressed I am with her skills, knowledge , friendliness, and genuine love for animals. I attended the seminar in Littleton, MA. I just wanted to say thank-you for sharing all your knowledge and training techniques. Since the seminar, I’ve finally taken a deep breath and switched my business to almost entirely clicker training…I am so much happier. My clients are getting quick success with their dogs. You’ve made me a much better trainer. I had no idea until I started to apply everything I’ve learned in my business and my life. I just wanted to thank you again for offering the seminar. One of the best conference presenters. Kathy is amazing and is a multi-faceted presenter. More than this we can hardly expect. She’s a “Hall of Famer” in my book. I always learn something unique from Kathy.